Cool find for Leonard Rosenman fans! Just in time for Woody Guthrie's 100-year celebration currently underway, Intrada is proud to present world premiere of Rosenman's Oscar-winning score. 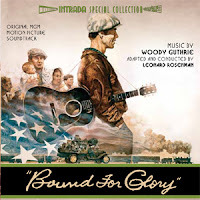 Rosenman not only adapted famous Guthrie tunes for Hal Ashby film with David Carradine but composed some 20 minutes of his own original orchestral music in signature style. Results brought him an Academy Award in 1976. Composer himself spoke of desire to one day revisit music in miniature symphony form for concert performance but it was not to be. At one point we were simply going to present premiere CD release of wonderful United Artists LP featuring abundance of tuneful depression-era Guthrie material with mere snippets of original score mingled within album tracks. 4/5 I am liking this score and music, but I cannot decide which I like better?